Nestled in the rolling hills of Northwestern Illinois, Galena is like a step back in time. Eighty five percent of its buildings are within the Galena Historic District, which is listed on the National Register of Historic Places. All along Main Street the architectural style and historic feel create a unique atmosphere. Trolley cars follow routes north and south on Main Street and connect shopping to parks and wineries. Downtown Main Street has more than 125 shops, galleries, restaurants and wineries, one door after another, all along a half-mile stretch. 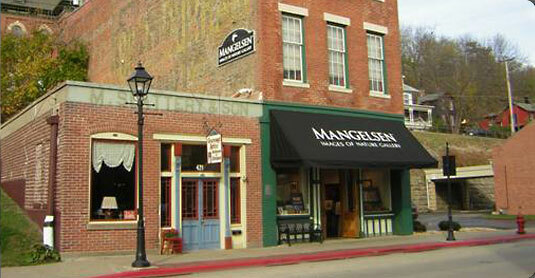 Galena is also known for its B&Bs, guest houses, inns, hotels and resorts. A tourist destination hosting well over one million visitors each year, popular with Chicagoans, many of whom keep second homes in the area. Just inside the flood gate is MANGELSEN—Images of Nature Gallery. It’s been located on Galena’s historic Main Street for nearly 25 years. It’s become a staple in the community and is a “must- see” stop if you like fine art nature and wildlife photography. Only a 15 minute drive away, visitors can also travel to Dubuque, Iowa…another historic city and treasure in its own right. Home to one of the world’s greatest wonders, Dubuque is the destination for anyone looking to take in the Mighty Mississippi River. From luscious green parks to art-filled riverwalks, there are ample opportunities to see the breathtaking beauty of where Iowa started. Photos of MANGELSEN—Images of Nature Galleryy by Sue Cedarholm. Photos of the city and surrounding areas courtesy of the Galena/JoDaviess County Convention and Visitors Bureau. The Peggy Notebaert Nature Museum is hosting “A Life in the Wild”, an exhibition containing 40 of Mangelsen’s most resonant images—images that take viewers on a journey into the haunts of iconic species whose struggles for survival are metaphorical fulcrums for reflection in the 21st century. A weekend celebration of the birthday of our 18th president, Ulysses S. Grant, right here in Galena. U.S. Grant lived in Galena prior to the civil war and ran for president while living in Galena. The U.S. Grant Pilgrimage is a weekend full of activities for the general public and scout groups, celebrating Ulysses S. Grant's birthday. Enjoy Civil War reenactments & encampment, the Galena Fire Department’s bucket brigade and watch as Midwest scouting group’s parade down Galena’s Historic Main Street. Championship golf, hiking, biking, boating, horseback riding, tennis, fishing, hot air balloon rides, swimming, spa, lodging, cross country skiing, ice skating, sledding, etc. Eagle Ridge is a resort for all seasons! Skiing, snowboarding, lodging, alpine slide, zip line, Mississippi River Cruises, mini golf, and bike rentals. Explore the many parks and trails in Galena. Bring your hiking boots or rent a bicycle for a scenic and breathtaking ride. Visit Casper Bluff Land & Water Reserve, Galena River Trail, Grant Park, Horseshoe Mount Preserve, Galena Gateway Park and more. Galena Cellars Winery, Blaum Bros. Distilling Co., Galena Brewing Company, and others. Fashion boutiques, antiques, crafts, collectibles and locally-made gourmet fares. Voted one of “America’s Best Main Streets” by Fodor’s Travel and Parade.com, you’ll love browsing through Galena’s 19th-century downtown with more than 100 storefronts. Historic city trolley tours, house tours, ghost tours, river cruises. Part aquarium, part museum, part science center, the National Mississippi River Museum & Aquarium (In Association with the Smithsonian Institution) inspires stewardship by creating educational experiences where history and rivers come alive! The 14-acre campus on the banks of the Mississippi River features two separate two-story buildings and an expansive outdoor plaza. The Museum & Aquarium is home to over 100 species of animals and thousands of historic artifacts. The Diamond Jo Casino, The Q Casino and Iowa Greyhound Park in nearby Dubuque, IA (15 miles). Established in 1921, Cannova’s continues to offer specialty pizzas including the Classic, the Sicilian and the Chicken Tuscany along with a variety of Italian favorites like Lasagna and Chicken Parmesan. The quaint and cozy pizzeria also features an interesting selection of wines. Galena's Fried Green Tomatoes restaurant serves the finest USDA Choice Steaks, Fresh Seafood and boasts a Wine Spectator Award Winning wine list. Outstanding service and an inviting atmosphere make Fried Green Tomatoes a must stop while in downtown historic Galena, Illinois. A cozy bistro preparing European-style fare such as schnitzel, steak frites & garlic roasted chicken. Enjoy a glass of French wine with an appetizer or a bottle of German beer with some chicken liver pate! Whatever your taste or appetite, Fritz and Frites will meet or exceed your expectations. Both a Café and Lounge focusing primarily on breakfast and lunch. Otto’s offers food options and an atmosphere not provided by other restaurants in Galena. They have an ever changing menu focusing on healthy home cooking, organic and vegetarian options, featuring local products where and when possible. On weekend evenings they offer light dinner specials, appetizers, homemade desserts, coffee, tea, wine, beer and spirits. Family owned and operated, Vinny's Italian eatery serves up steaming plates of tasty traditional meals like chicken marsala, veal parmigiano and fettuccini alfredo. The cozy interior space features an old world-style deli, three separate levels for dining, exposed brick walls, large windows and checkered cloths on the tables. The historic Goldmoor Inn is the only Galena bed and breakfast located high above the banks of the Mississippi River with stunning views of the river. The Goldmoor bed and breakfast is located just minutes from downtown Galena, Illinois offering whirlpool suites, private fireplaces, a private in-room gourmet breakfast, and a romantic dining experience. Enjoy Thomas D. Mangelsen nature and wildlife photography in the lobby. Jail Hill Inn offers gracious lodging for a perfect getaway. The inn delivers the ultimate in relaxation, luxury accommodations and location. Tucked away, yet close enough to walk to Galena’s historic Main Street, the 135-year-old, 4-story brick building (which served as the county jail for nearly 100 years) has been lovingly transformed into Galena’s premier bed and breakfast inn. Enjoy Thomas D. Mangelsen nature and wildlife photography throughout the inn. Built in 1855, this historic hotel has played host to Civil War Generals and U.S. Presidents. It is Illinois’ oldest operating hotel and features 55 Victorian-style guest rooms, enclosed guest parking, three restaurants, meeting, banquet and wedding facilities along with a self-guided historic walking tour. Enjoy a relaxing and comfortable outdoor lodging experience indoors. With 75 uniquely designed guest rooms and suites located in Galena, Illinois, you can enjoy the original Stoney Creek wooden details that give you a place to escape and unwind. Enjoy one of Galena's wonderful Bed and Breakfasts for a unique, relaxing, homey getaway. There are many to choose from depending on your style! In 1839, travelers’ first sight as they crossed the Mississippi River into Dubuque was a hotel on the corner of 2nd and Main. This old “Julien Hotel” hosted famous guests such as Abraham Lincoln, “Buffalo Bill” Cody and Mark Twain before it burned to the ground. Rebuilt in 1915, it gained notoriety thanks to Al Capone and was ultimately purchased by the current ownership in 1962. Now 180 years later, after a $30 million interior renovation and exterior restoration, the Hotel Julien Dubuque has redefined elegance through the blending of its rich history with modern luxury and style.